Barry Ritholtz of Fusion IQ and The Big Picture blog thinks the talk of a housing recovery and a general economic recovery are very premature, and that what we’re experiencing now is relief that we avoided financial Armageddon — not real forward movement. 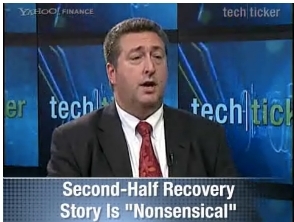 As for talk of a second-half 2009 economic recovery, Ritholtz says that is “nonsensical”, with key recovery signs — inventory building, hiring, capital expenditure spending — all missing. As for the stock market, Ritholtz — who turned quite bullish earlier this year — is still 70% in stocks, but he thinks a pullback is a distinct possibility later this year. Bear Market Winners: A Good Long-Term Bet?